Another frat is in the news. 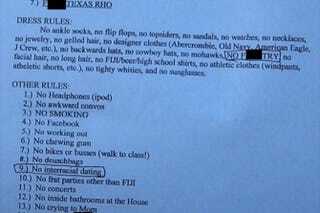 According to Raw Story, the University of Texas at Austin chapter of Phi Gamma Delta is in the news after it posted rules—racist and homophobic prohibitions included—in the frat house. The letter, which was supposed to be confidential and also shows that one of the members probably needs to brush up on his spelling, reminded members that drugs, drinking and driving, smoking and wearing headphones were frowned upon. “F—etry,” interracial dating and Mexicans were also not welcome. Last month the fraternity came under fire after hosting a “Western-themed” party at which members and guests dressed in offensively stereotypical Mexican outfits, Raw Story notes. Students came together after the party asking the university president to punish the chapter. That investigation, however, is ongoing.